An ancient sight-hound breed, the Sloughi was developed in North Africa as a desert hunter of fox, hare, jackal, hyena, wild boar, and gazelle. They were highly treasured and the only dog that were treated as a member of the family. Due to the French occupation and a rabies epidemic, the Sloughi breed was decimated. Today this breed is exceedingly uncommon and rare. The Sloughi is tall, elegant, and slender. They exude a noble, graceful, and aristocratic demeanor. 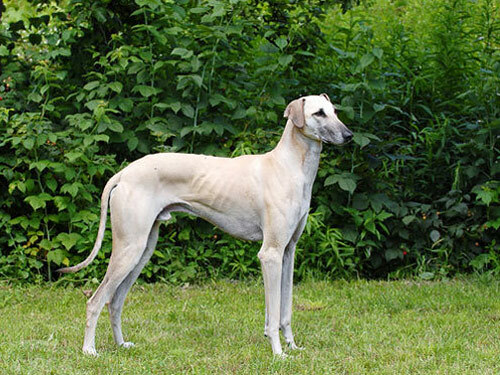 Extremely athletic, this breed is capable of jumping great heights and is a swift runner. They are active, alert, highly intelligent, and possess a fastidious and gentle manner. An affectionate and loyal breed, the Sloughi forms a strong and deep emotional attachment to their master and family. As a result, they do not change ownership easily. They are cautious, aloof, and wary with people they do not know. This breed is a reliable and dependable watchdog. The Sloughi is not recommended for the novice dog owner. They do best in a home with older considerate children and with household pets they have been raised with. Care should be taken with small pets such as cats or small breeds of dogs as the Sloughi may continue to interpret them as prey even if they have been raised with them. They have a strong emotional sensitivity and do not do well if stressed or if there are changes in their routine. This breed requires a harmonious and peaceful home environment. The Sloughi does not do well if left alone for extended periods of time either indoors or outdoors, as they will become bored and destructive. They are not recommended for a two career family. The Sloughi requires occasional brushing with a firm bristle brush. Bathing or dry shampooing should be done only when necessary as they have very dry skin. They do not do well in cold climates. This breed is prone to progressive retinal atrophy and hemophilia. It is important to remember that the Sloughi is a sight-hound and will chase anything and everything that moves. With the capability to reach speeds of 37 mph this breed will become so focused on the object they are chasing that they quite quickly find themselves in perilous danger. The Sloughi has an extremely smooth, soft, and dense coat. It is short, fine, and lies close to the body. The coat comes in such colors as light sand, mahogany red, red with black brindle, or red brindle. There are typically black or white markings. This breed is an average shedder. As an independent thinker, the Sloughi can be somewhat stubborn and want things their own way. They will not respond to harsh or heavy-handed training methods. This breed requires positive reinforcement, consistency, respect, firmness, fairness, and repetition. They may be difficult to housebreak. The crate training method is recommended, but should not be used excessively. The Sloughi does not do well in confined spaces for lengthy periods of time. The Sloughi requires daily exercise and makes an excellent jogging companion. They prefer to be involved with family activities and thrive on attention. They will do okay in an apartment or condominium dwelling provided they are sufficiently exercised and stimulated. They enjoy securely leashed walks and playing in a safe and highly fenced yard.